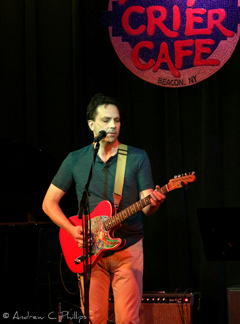 Jerry Kitzrow, singer/guitarist/songwriter and frontman for The Flurries, will be giving an intimate solo performance, featuring stripped-down versions of Flurries songs, as well as interpretations of some of his own favorite writers. The Flurries are a trio from the arts town of Beacon NY, and have just put out their newest record, “Tail of the Comet,” released in 2018. Jerry broke in to the business as a lad of 18 with The Bandables, young darlings of the NYC music world, and later formed the alternative act, Wild Honey. After some time away from the business to start a family, Jerry returned with The Flurries, releasing their first record, “Colour Show,” in 2014. This unique performance will range from lush romantic jazz/torch vocals to the lively chime of Jerry's Rickenbacker 12 String – and will welcome some of the best Beacon musicians as select guest performers.